Route type: Short demanding tour taking you to viewpoints. Overview: From Porto Koufo you travel on the coastal road and then start to ascend on a sandy gravel road towards the interior. You continue for 5 km with the odd flat stretch, giving you a bit of a break. From the summit, you travel downwards towards Sykia and from here you have two choices to follow. A. For fitter, more experienced cyclists. It brings you to the ridge giving you wonderful views of Mt. Athos across the sea. You get on a sandy trail which eventually brings you back to the main road. Careful of the goats! B. 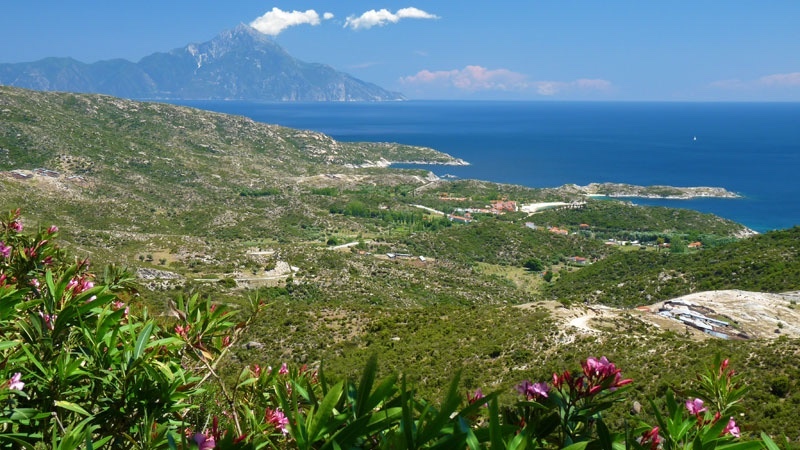 This is an easier route, but a little longer – taking you back to the main road of Sithonia and back to Porto Koufo. A detailed description with a map is found on page 58 of the Halkidiki Bike Guide, see below.